POP 2!!! 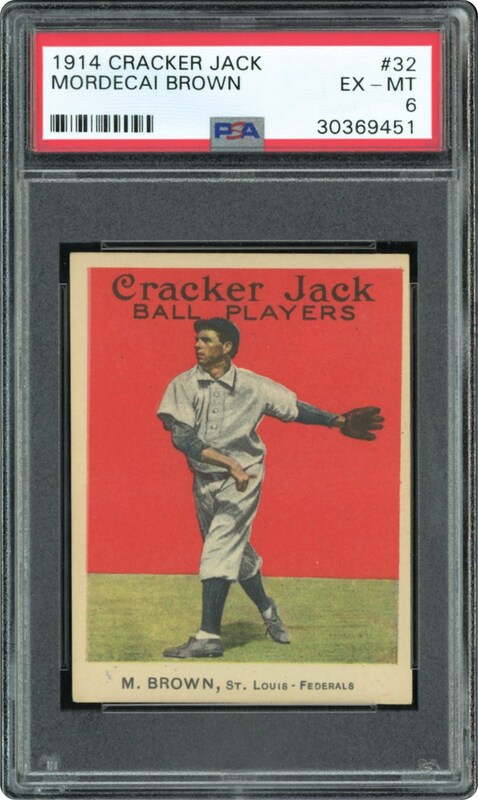 This ultra-desirable 1914 Cracker Jack Mordecai Brown residing in a stellar PSA 6 EX-MT holder stands tall as one of his most formidable baseball cards extant, having eluded the typical heavy caramel corn stains that plague many of the 1914 Cracker Jack specimens. Due to a serious farm accident, two of Brown's fingers were damaged on his right hand, eventually leading to the right-hander's iconic "Three Finger" nickname and incredible Hall of Fame career. 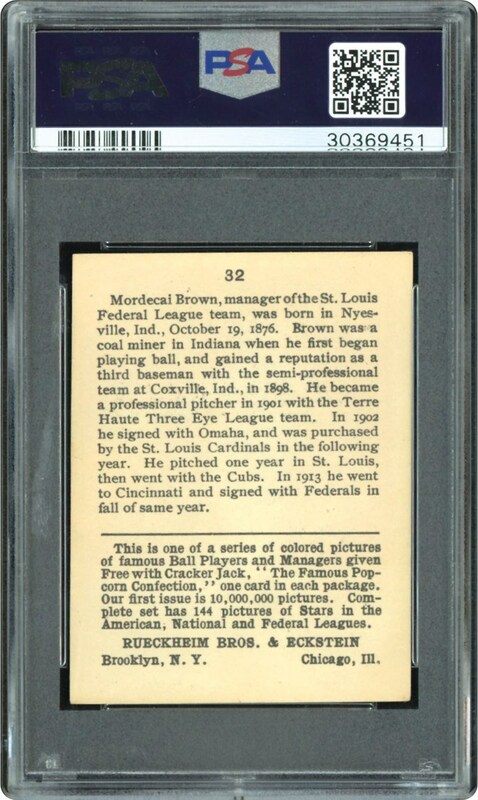 Who would have possibly guessed that Brown's deformed fingers would generate virtually "un-hittable" movement on his pitches, ultimately resulting in Mordecai achieving the third lowest lifetime E.R.A. with a microscopic 2.06 figure. Brilliant focus and contrast are the highlights of this world-class image that is affixed to a breathtaking near-flawless red backdrop. Strongly qualifying as one of "Three Fingered" Brown's most coveted baseball card issues, it is truly worthy of an esteemed place in any formidable PSA Registered 1914 Cracker Jack gathering! POP 2 with a single card grading higher.